Mortgage rates are at their highest levels since April 2011. According to the latest data released Thursday by Freddie Mac, the 30-year fixed-rate average jumped to 4.90 percent with an average 0.5 point. (Points are fees paid to a lender equal to 1 percent of the loan amount.) The 19-basis-point jump (a basis point is 0.01 percentage point) was the largest one-week spike in the 30-year rate since November 2016, when it increased 37 basis points. The 30-year fixed rate was 4.71 percent a week ago and 3.91 percent a year ago. 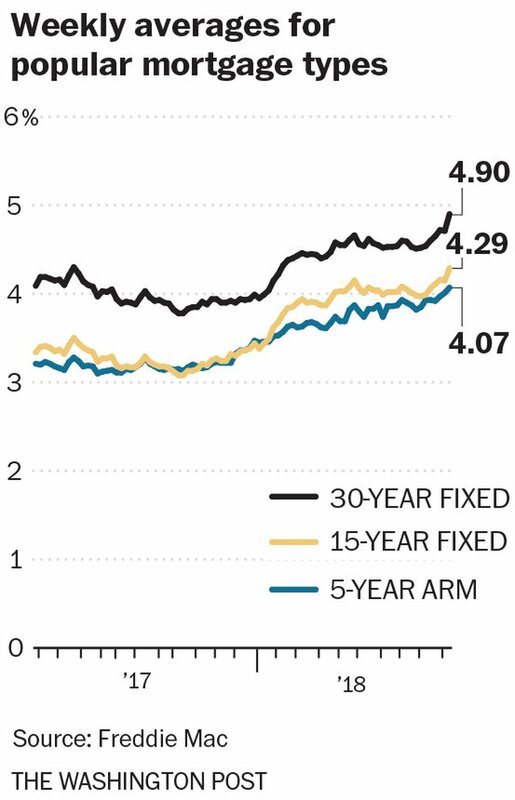 The 15-year fixed-rate average climbed to 4.29 percent with an average 0.5 point. It was 4.15 percent a week ago and 3.21 percent a year ago. The five-year adjustable rate average rose to 4.07 percent with an average 0.3 point. It was 4.01 percent a week ago and 3.16 percent a year ago. "Strong employment and payroll data releases met analysts' expectations, providing more evidence of a booming U.S. economy," said Aaron Terrazas, senior economist at Zillow. "Markets tend to move in fits and spurts, with sharp movements often followed by brief retreats, as we've seen over the past few days. But there is no doubt that the trend is decisively higher, and comments from several Fed officials bolstered the notion that the American economy can withstand higher rates." Mortgage rates are influenced by many factors but significantly by investors' expectations. A strong economy tends to cause home loan rates to increase. One way to predict where rates are headed is to track the movement of long-term bonds, particularly the 10-year Treasury. When yields to up, mortgage rates tend to follow, and the yield on the 10-year bond has been on an upswing recently. It grew to 3.23 percent on Friday, rising 14 basis points since the start of the month. It has retreated the past couple of days but still is hovering around 3.2 percent. The last time the yield on the 10-year Treasury was this high, mortgage rates were around 5 percent. Danielle Hale, chief economist at Realtor.com, expects rates to rise to that level next week. 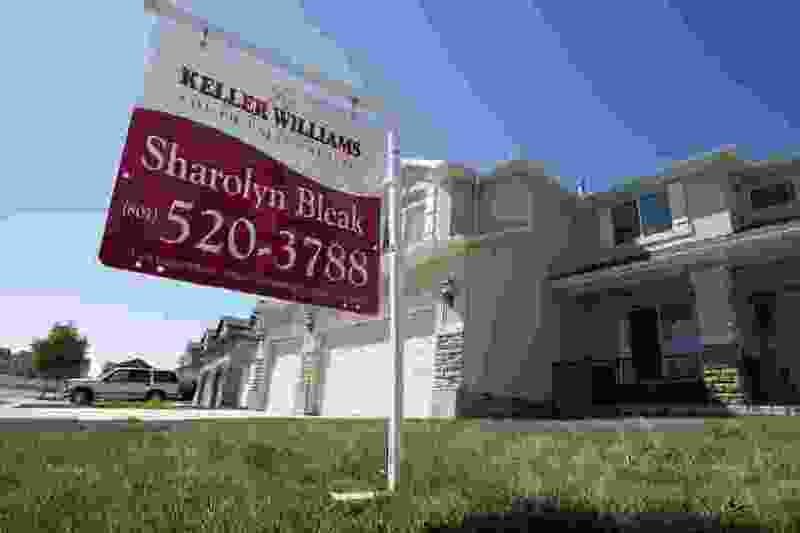 "Although a 5 percent mortgage rate is historically low, crossing this threshold could have a sticker-shock effect on some buyers currently in the market," she said. "We could see some buyers, especially first-timers, leave the market as a result." Bankrate.com, which puts out a weekly mortgage rate trend index, found that a majority of the experts it surveyed say rates will continue to rise in the coming week. However, a third predict that rates will remain about the same. Michael Becker, branch manager of Sierra Pacific Mortgage, is one who sees rates holding steady. "Treasury yields and mortgage rates are now at their highest levels in seven years," Becker said. "Bond markets have quickly repriced for current economic conditions. The fact that no negative shocks to the markets, like a trade war, have caused a flight to safety and bid for bonds means this spike in rates is here to stay. However, I do think the worst of the spike in rates is over and we can stay at the current levels for the coming week." The upturn in mortgage rates has begun to put a damper on the housing market. "Rising rates paired with high and escalating home prices is putting downward pressure on purchase demand," Sam Khater, Freddie Mac's chief economist, said in a statement. "While the monthly payment remains affordable due to the still low mortgage rate environment, the primary hurdle for many borrowers today is the down payment, and that is the reason home sales have decreased in many high-priced markets." The slowdown in the housing market is reflected in mortgage application activity, which fell off this week, according to the latest data from the Mortgage Bankers Association. The market composite index — a measure of total loan application volume — declined 1.7 percent from a week earlier. The refinance index fell 3 percent from the previous week, while the purchase index slid 1 percent. The refinance share of mortgage activity accounted for 39 percent of all applications. Yet, Bob Broeksmit, MBA's president and chief executive, remains optimistic.